Recently, JFJ were happy to supply some premium oak flooring to a popular venue in Somerset. The Tarr Farm Inn is a high-class hotel, restaurant and wedding venue located right on the stunning Tarr Steps of Exmoor National Park. In their search for a flooring material for their restaurant that would complement their luxury countryside appeal, they came to us. In 2017, The Tarr Farm Inn was named as one of the Top 50 Gastropubs in the UK. It is only fitting, then, that every detail of their interior decor should reflect this high quality and distinctive style. Rich, high-quality materials are key factors to creating this atmosphere, which guests expect when staying at an inn that offers them gestures such as homemade biscuits in their room! The restaurant has the feel of a traditional British country pub, but with a real sense of classic luxury, and is used for everything from daily evening service to intimate weddings. So, the flooring really had to be perfect. Luckily, we were able to help the team at The Tarr Farm Inn to choose a board that was completely in-keeping with their traditional country feel, whilst sleek enough to elevate the space with a sense of modernity. The Lundy Engineered Oak 190mm x 20mmL was the choice we came to. This board is high quality and reliable engineered oak flooring, with a distressed finish that creates a rustic aesthetic with knots, splits and other natural features. It was fitted with Elastilon underlay, and completed with a medium oak Treatex colour tone and a clear matt treated hardwax oil for that natural, smooth effect that married beautifully with the existing space. 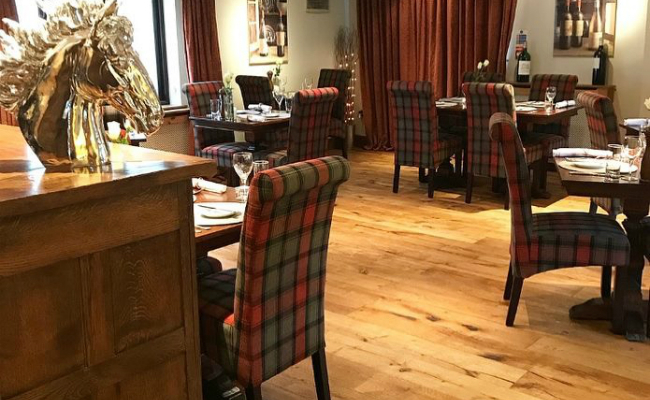 We are delighted to know that The Tarr Farm Inn is so happy with the final product, and think the flooring looks fantastic alongside their chic dining furniture. They have achieved a truly timeless style that customers are sure to love. If you would like to enhance your space, just like the Tarr Farm Inn did, contact us today to find out about our extensive range of high quality engineered wood flooring. Interested in what makes the best engineered wood flooring out there? Check out our article on the link for more.